To be clear, Davenport and his business partner Colin Davis aren’t your typical New England fisherman. They met as roommates in Cambridge, Massachusetts while Davenport was working in the biotech industry and Davis ran a farm-to-table grocery business. With their backgrounds, it may make sense that aquaponics was a natural outgrowth of their friendship. 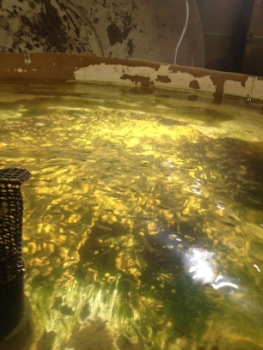 The duo started out with a hobby fish hatchery in their basement that ballooned to a young colony of 10,000 trout. But before they hauled in a big catch, they hauled in a notice from their landlord. This was perhaps a blessing in disguise because it forced Davenport and Davis to find a warehouse in nearby Salem to house their growing business, although that step up didn’t necessarily help the Redemption crew get out of the underground. Redemption Fish Company is making the most of not only their location and market conditions, but also their aquaponic system. The company raises rainbow trout — a prized fish in New England because of its scarce availability and highly coveted flavor — as well as tilapia, hybrid­ striped bass, and landlocked Atlantic salmon. With the aid of the effluent from the fish, the operation grows basil, lettuce, kale, ghost chili pepper plants, tomatoes, and wasabi. Not all of Redemption’s products have made it to market yet. In fact, many of them are still in the research and development phase. But the company’s trout, sold at a few local farmers’ markets, has helped them keep their heads above water in the company’s early phases and establish a brand built on quality. To keep up the momentum but also achieve profitability, Davenport says Redemption is embarking on a fundraising campaign to capitalize the company beyond family resources and the contributions of a few enthusiastic supporters. Redemption needs the money specifically to build out a facility that can support the ambitions of the company. With a fully developed facility, Davenport says Redemption could produce 200,000 pounds of fish and about one million pounds of produce per year. But first, they have to convince local Greater Boston funders that large-scale aquaponics is a better investment than the quicker returns to be found in tech startups and other opportunities. If Davenport and his team succeed, Boston-area eaters can expect an even larger stream of fresh seafood that helps them support local New England fish and make progressive food choices, on the strength of a non-conventional source. And keeping fresh fish on tables across New England may depend on it.